Phil Plait is a Rachel Maddow fanboi and I can’t say I blame him. Though Rachel is fallible and has made mistakes before, more often than not, she hits the proverbial nail on the head, so when she gave her commentary on Climategate, the ACORN “scandal,” and other right-wing, anti-reality nonsense, Phil couldn’t resist linking to her video (and commenting on it…worth a read)… and I couldn’t resist watching it. Phil rightly comments that the far right doesn’t have the copyright on nonsense, but the Republican “unholy alliance” it has formed with fundamentalist religion has led it to its pervasive anti-reality stance. Global warming is real. Evolution is real. Vaccines do not cause autism. Homeopathy doesnâ€™t work. These are facts, and they donâ€™t care whether or not denialists spin, fold, and mutilate them. Until we face up to reality, however, they will spin, fold, and mutilate us. 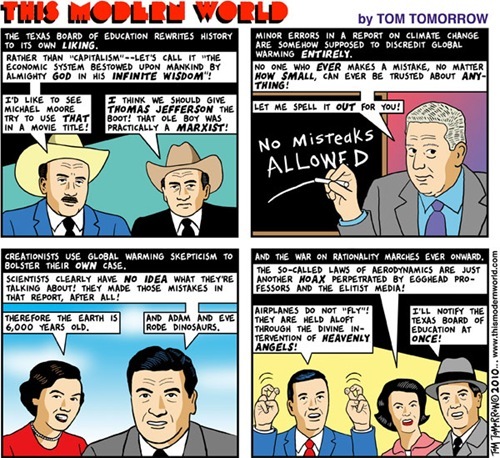 Tom Tomorrow rounds up some denialist, right-wing, anti-science, creationist crazy… all in one comic. I managed to get on the mailing list of Worldview Weekend, which tends to be one of the largest repositories on the internet for right-wing, religious, conspiracy-theory crazies. I leave myself on the list for entertainment purposes and I’ve yet to be disappointed. Unfortunately, it’s a little scary, too, because I know there are people who actually believe what’s being presented on the site. This week, Phyllis Schlafly decided that she was going to take on the role of climatologist in a piece titled Global Warming Is Frozen Over, with predictable results. Here’s her opening salvo. Whether or not the groundhog sees his shadow on February 2, there’s no denying that January put into a deep freeze the claims of crisis by global warming alarmists. Frigid temperatures destroyed fruit and coral in Florida, and snow fell on Al Gore’s palatial home in normally warmer Tennessee. What I find most significant is that she thoroughly discredits herself in her first sentence by demonstrating a significant lack of understanding about global warming. She’s not the only one, though, as I’ve seen similar claims made by people all over the internet and even among my friends on Facebook. It’s as if Schlafly (and the others) completely overlook the meaning of the word “global” in “global warming.” They also tend to misunderstand (or ignore?) the difference between “climate” and “weather.” In addition, from what I’ve generally seen, they also have a very thin grasp on science in general… especially when science points to something that contradicts their firmly entrenched political or religious ideology. Those disclosures told the world about some scientists’ willingness to suppress climate-change data and rig the process in order to pretend there is consensus among scientists about global warming, to ostracize contrary views, and to promote their globalist agenda. As anyone who’s honestly followed the incident knows, the CRU emails did no such thing. The inclusion of “globalist agenda” is also discrediting and points to her conspiracy-theory leanings, something which will no doubt endear her to global warming denialists everywhere. In her rant, Schlafly says that lowering our level of emissions to the level that Obama has proposed will also lower our standard of living to 19th century levels, that Scott Brown’s election in Massachusetts “repudiated cap-and-trade,” and that Osama Bin Laden has blamed the United States for not stopping global warming (as if the notion that Bin Laden accepting global warming somehow means it’s not true). She also includes lengthy quotes from Czech Republic president Vaclav Klaus as if he is some sort of leading climatologist when it seems, based on the included quotes, that he’s basing his analysis on political ideology instead of on science. Of course, no Worldview Times rant on global warming would be complete without a reference to Al Gore and An Inconvenient Truth and, for an added bonus, Schlafly includes a slam on The Story of Stuff, a video that promotes conservation, albeit in polemic way. In her conclusion, Schlafly says that what we need to do to solve unemployment and poverty is to increase our use of energy (which is Schlafly’s way of saying “burn more fossil fuels”). Think I’m kidding? The main cause of unemployment and poverty is the lack of enough energy. Rather than expanding government to limit energy, we should be increasing the use of energy to eradicate hardship. In the immortal words of Wikipedia… Citation needed. I follow the Skeptical Science blog and I took special interest to today’s post by John Cook about a debate featuring Ian Plimer and Christopher Monckton versus Barry Brooks and Graham Readfern. I’ve only heard Monckton speak before and he has shown himself to be mostly full of schlock conspiracy theories, smoothly twisting (or fabricating) facts to make his climate change denialist points. However, aside from the debate summary, what I found interesting was one of the statements in Cook’s conclusion, which fits the denial-o-sphere so exceptionally well. Cook was explaining that, though Plimer and Monckton were both deniers, they reached their conclusions through contradictory points, one basing his conclusion (basically) on the idea that our climate is sensitive and the other basing his conclusion on the idea that it’s not sensitive. Both speakers got applause from the deniers in the audience when presenting their contradictory arguments. Replace the topic of “global warming” with the topic of “evolution” and his conclusion is just as valid. To the deniers, consistency… or scientific evidence… or reality… isn’t important. What is important to them is to mislead… to twist the argument any way they can… to repeatedly bring up claims, regardless of whether the claims have long since been refuted… to use emotional or political arguments that have nothing to do with the science… to distort, cherry pick, and fabricate evidence in whatever way possible in their attempts to inject unwarranted doubt into the issue. Why? Because they so want reality to conform to their pre-conceived political, ideological, or religious notions that they’re willing to use virtually any means at their disposal to keep their fortresses of self-delusion from tumbling down. I’ve seen that in action. I’ve heard deniers admit as much. What makes it worse is that they vigorously spread their misinformation, drag others down with them, and hobble any notion of having an intellectually honest discourse. …because honesty… like consistency… like truth… is irrelevant to them. If it’s cold, it’s evidence! I find it noteworthy that the global warming deniers, many of whom were touting the recent cold snap in the USA as evidence against global warming, are strangely silent about the recent warm temperatures we’ve been having. In Pennsylvania, it was about 60 degrees this morning, which is pretty high for this time of year… not unheard of, but definitely high. The entire past week has been warmer than usual, actually. Now, those who understand anything about climate change understand that local temperature variances really say nothing about global climate change (hence the word "global"), but the deniers latch onto this sort of thing and wave it around as if it somehow validates their conspiracy theories. The caveat is that they only do it when it suits their purposes. If there is contradicting "evidence," it is ignored. Evolution deniers do the same thing… tout irrelevant things as evidence in support of their delusion, but ignore (or deny) evidence that refutes it. Anti-vaxxers do it, too… as do moon hoaxers, flat earthers, 9/11 truthers, and Obama birthers. It’s a common theme among conspiracy theorists. And all that is fine… unless they have any political clout. Sadly, that seems to be the case in some instances. 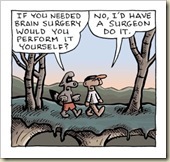 From Calamities of Nature comes this comic (the image here is just the first panel). I don’t want to spoil it for you, but I’ve heard a similar argument made by Sam Harris concerning the word “elite” in a Newsweek essay about Sarah Palin and politics last year. Not exactly the same argument, but related. The comic brings up a valid point (though highly simplified to fit into three panels) and I’ve commented on it before… with no small amount of disdain. The point is relevant to more than the topic addressed and I’ve encountered the same seeming inconsistency-of-thought regarding evolution, the age of the Earth, cosmology, and a few other science-related topics. It’s an attitude that science is great… unless it conflicts with your political or religious ideology… that it’s better, in that case, to trust someone who’s not too educated, not too intelligent, not too well informed, not too “elite”… rather than someone who is highly trained in the related field. Ask yourself: how has “elitism” become a bad word in American politics? There is simply no other walk of life in which extraordinary talent and rigorous training are denigrated. We want elite pilots to fly our planes, elite troops to undertake our most critical missions, elite athletes to represent us in competition and elite scientists to devote the most productive years of their lives to curing our diseases. And yet, when it comes time to vest people with even greater responsibilities, we consider it a virtue to shun any and all standards of excellence. When it comes to choosing the people whose thoughts and actions will decide the fates of millions, then we suddenly want someone just like us, someone fit to have a beer with, someone down-to-earthâ€”in fact, almost anyone, provided that he or she doesn’t seem too intelligent or well educated. It’s a huge problem in this country today. Over at EvolutionBlog, Jason Rosenhouse links to an editorial by Steven Newton, a project director for the National Center for Science Education. The editorial is posted on Huffington Post, which, as Rosenhouse points out, is "not usually the go-to place for intelligent commentary on scientific issues," but in this case, Steven Newton represents the NCSE and does it quite well. From evolution to global warming to vaccines, science is under assault from denialists–those who dismiss well-tested scientific knowledge as merely one of many competing ideologies. Science denial goes beyond skeptical questioning to attack the legitimacy of science itself. Science requires conclusions about how nature works to be rooted in evidence-based testing. Sometimes progress is slow. But through a difficult and often frustrating process, we learn more about the world. Science denialism works differently. Creationists are unmoved by the wealth of fossil, molecular, and anatomical evidence for evolution. Global-warming denialists are unimpressed by mountains of climate data. Denialists ignore overwhelming evidence, focusing instead on a few hoaxes, such as Piltdown Man, or a few stolen e-mails. For denialists, opinion polls and talk radio are more important than thousands of peer-reviewed journal articles. Understanding science has never been more important than it is today. Critical issues such as climate change and the threat of newly evolved flu strains demand greater scientific literacy among the public and politicians. As long as scientists must squander their time defending their work from denialism, we will fall behind on our fundamental responsibilities. Check out the full piece. Newton makes some great points about denialism, things I’ve seen happen over and over. What makes it increasingly frustrating is that the denialists themselves can’t recognize what they’re doing. They think they’re actually being scientific. They think they’re rational. They think they have actual damning evidence. They’re not, they aren’t, and they don’t.